"Ellasif was the only witness to her infant sister's first breath. What followed was not a newborn's wail, but merry peals of laughter." 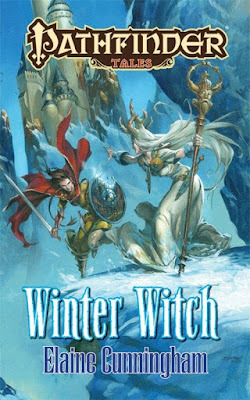 Pathfinder Tales: Winter Witch by Elaine Cunningham and Dave Gross. Gamer Fiction is a bit of an odd thing for me. I admit I enjoy it and sometimes I find something good. But there is a tinge of guilt that I am "wasting my time" and not reading something better. I guess this makes it the very definition of "guilty pleasures". Winter Witch is no different. Elaine Cunningham has been writing for years and has some notable titles under belt. It will not be confused with great literature, but it is also not supposed to be. 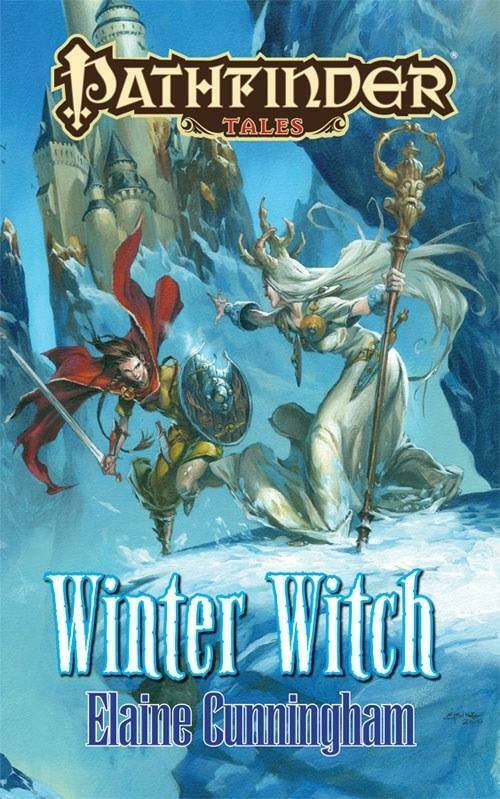 It is a fun little romp through a frozen world with a wizard turned forger and cshieldmaiden looking for her sister. Ellasif, the aforementioned shieldmaiden is the hero of our tale and the most interesting. She obviously loves her sister Liv, but is also not a little afraid of her. Her beginning story was very interesting. I could not help but feel it was nice mix of Slavic, Saxon and Celtic myths all rolled into one. The story then shifts to the tale of a wizard (we later learn) and map maker forger Declan. Declan was not as interesting to me to be honest though the mystery around him was. These two unlikely heroes, grim Ellasif and urbane Declan, set off to find Liv and take her from the clutches of the Witches of Irrisen, maybe even from the clutches of Baba Yaga herself! The book was a fun, really quick read. Though I will admit there are parts of the ending I was not satisfied with. Unlike some game-related fiction, where you can practically hear the dice rolling in the background, this read much more like a novel. I read this one soon after a few Forgotten Realm novels so the competing descriptions of some the same spells (for example Fireball) were very interesting. I guess the question I ask myself is would I read another book by Elaine Cunningham? Yes, absolutely! Would I read another book with these characters? Maybe, depends on what the book was about. I was hoping that Feiya would make a cameo, but no such luck really. Maybe the iconics don't appear in books. This was another Audiobook find and the reader, Daniel Thomas May, did a great job. Witches in this book: Many. All of Irrisen, Baba Yaga, Liv and Mareshka. Are they Good Witches or Bad Witches: All the above. THough mostly they are Bad. Best RPG to Emulate it: Well. It is a Pathfinder book. Pathfinder is the obvious choice here. Use in WotWQ: Absolutely! I can't say for sure what or who will appear, but Irrisen will absolutely feature into the War of the Witch Queens. Expect to see Baba Yaga there too. Don't forget. Today is Beltane! 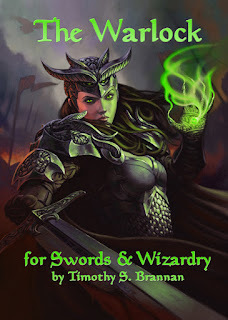 Pick up a copy of the Warlock for Swords & Wizardry.